This image is a result of collaboration with my observatory partner, Josep Drudis. Data were acquired with a Takahashi TOA130 refractor and super-reducer, providing a focal length of 760 mm at f/5.8, a plate scale of 2.43 arcsec/pixel and field-of-view of about 4.5 x 4.5 deg. An SBIG STX-16803 camera was used with Astrodon 3nm OIII, 5 nm H-a and Generation 2 RGB filters. A 2 x 2 mosaic was laid out and data were acquired from September 9- 22, 2017 from our equipment at the iTelescope.net site, Siding Spring, NSW, Australia. The panels were centered around RA 05hr 21m 59s and DEC -68d 20m 12s. About 10% overlap was used among the panels, which was a compromise between having the largest coverage and enough overlap for registration. 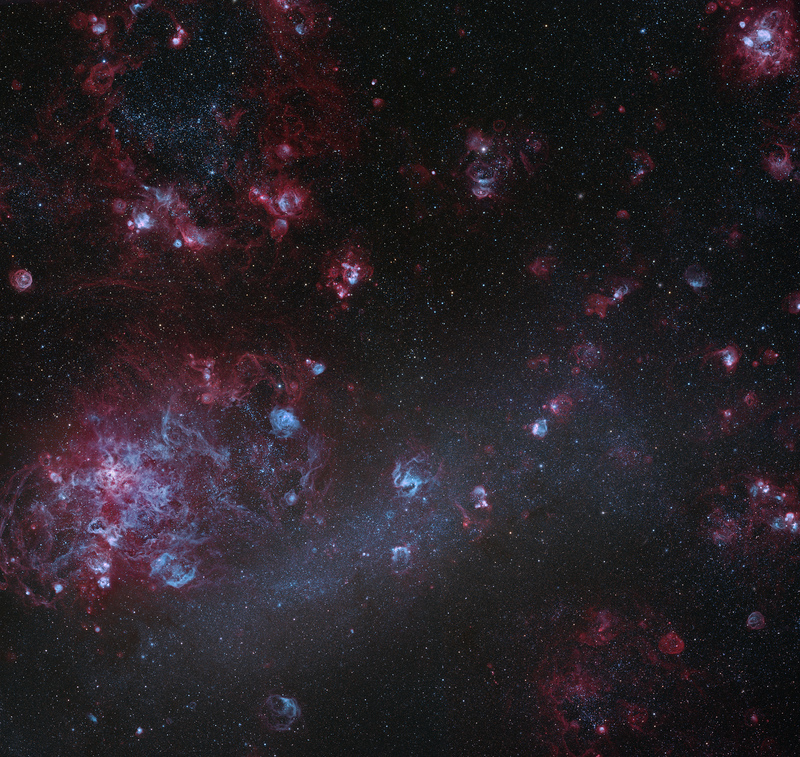 After the calibrated and processed master images from each of the four panels were completed, each was registered to a master image of the LMC downloaded from the internet that was used as a template. We thank Tony Hallas for suggesting to use this template approach. This template was first upsized to about 11k x 11k pixels to accommodate the side-by-side 4k x 4k individual panels. The program Registar (Auriga Imaging, Vancouver, B.C. Canada) was used for registration. Total exposure time was 44 hrs 10 min including 16 hrs 10 min H-a, 16 hrs OIII and 11 hrs 50 min RGB. The registered images were processed in Photoshop CC 2018 in multiple layers using layer masks. Care was taken to minimize boundaries between panels using the layer masks. The H-a data were colorized to red/magenta and the OIII to blue/green. RGB stars were then added. A super-luminance layer was additionally blended in. It contained both the H-a and OIII data, as well as high resolution data previously taken by the authors with a 20″ reflector (PlaneWave CDK20) at the site for objects like N70, the Tarantula Nebula (two sections), NGC 1968, N11, NGC 2035, NGC 2020, NGC 2014 and N44. For all these images, their superluminance (Ha, OIII) was used. All images were registered with the complete mosaic and blended in Photoshop CC 2018 using layer masks. This gives a crisper final image. 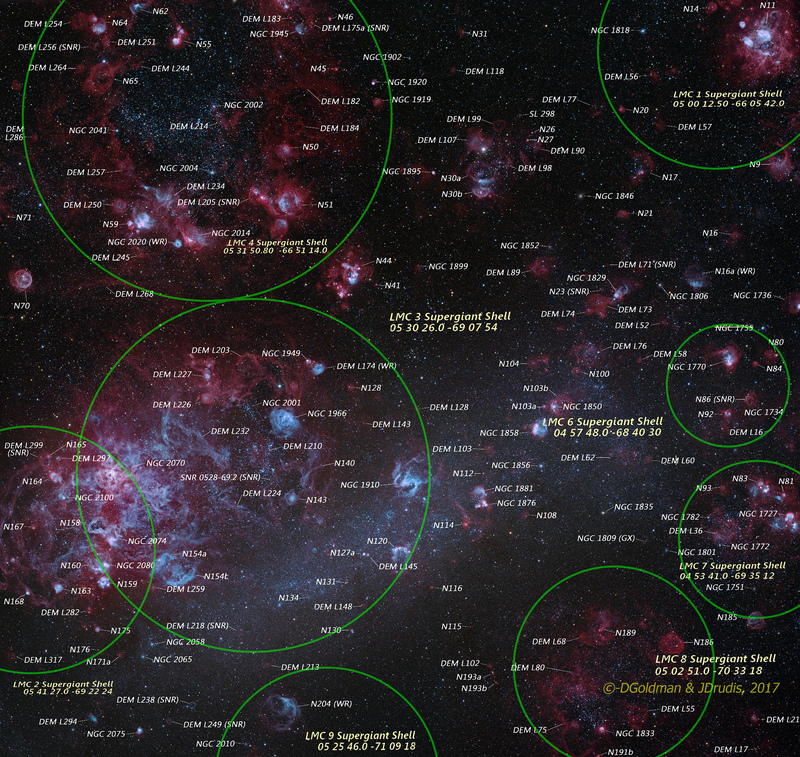 There are so many objects surrounding the LMC that we felt an annotated image would show this best. Annotations were produced with the assistance of Sakib Rasool. SNR is a supernova remnant. WR is a Wolf-Rayet nebula. DEM is the Davies, Elliott and Meaburn (1976) catalog.